1. Avoid the pressure of who to choose to invite to your child’s birthday party from their class – share the party with another child who has a birthday around the same time. Invite half the class each. It halves the cost and no child gets left out. 2. Take a group photo of everyone at the party and use it to make a thank you card to everyone who came. 3. Give the children a craft activity to do as they arrive – such as a large piece of paper they can decorate to use as a place mat. For toddlers, include an art project at the end – this calms them down before they are released into the general population. You will find many free children’s craft activities here. 4. When playing party games, make sure each one lasts no more than 5 minutes – any longer and children can become bored. You will find many party game ideas here. 5. Write out name labels for each child. When they win a prize stick the label onto the prize. Not only does this name the prizes, but you get to see who you have left and who hasn’t won a prize yet. 6. Plan, plan, plan! Involve the birthday child as much as possible – choosing the theme, games, music etc. Have a rough timetable of what you will be doing and when. 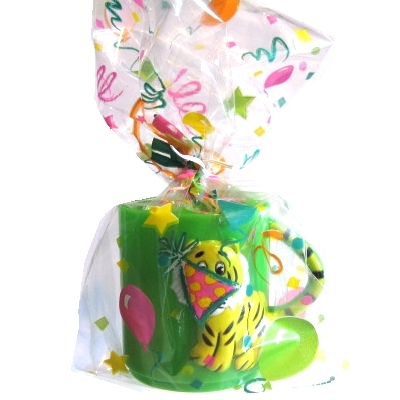 Make sure you prepare the party bags well in advance – you’d be amazed the amount of parents I’ve seen at parties who are still filling party bags 10 minutes before the party is due to finish! Expect lots of noise and chaos and embrace it. So long as you have planned well, all will be fine! As well as making all of our printed cotton party bags available in party bag size AND shopping bag size, we also have a lovely new range of bespoke cotton shopping bags. Do you own a small business, belong to a club or run a charity? Well now, for only £5.00 (yes, only a fiver) you can have your very own bespoke cotton shopping bag, printed with your own logo, plus web address, telephone number, twitter name.....whatever you wish. Made from 100% cotton, these printed shopping bags come with a choice of 2 handle lengths - short and shoulder length. Printed in house to the highest standards, there is no minimum order quantity and no expensive set up costs. So for £5.00 you can take your business with you wherever you go! Mine has been all over the place this past week, I can tell you! For more information and to order yours, click here. Always striving to offer you something new, and expanding our existing range, I'm now pleased to tell you all of our personalised cotton tote bags are available in party bag size and shopping bag size. You can find all these products in the personalised party section here. At this time of year, with the wedding season well under way, we are always deluged with orders for hen party bags. 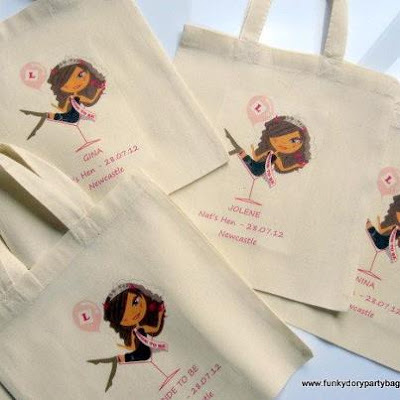 We offer a lovely selection of personalised hen party bags - from our budget paper party bags, through our most popular cotton tote party bags (pictured) to our drawstring cotton bags. Each of our bags can be personalised with your name and/or message and comes with our very own fun-loving hen. To make these party bags extra special, you can now choose which hen suits your bride-to-be the best! So which one is yours? Blonde, brunette or redhead? I've just updated an article I wrote about animal themed party ideas. 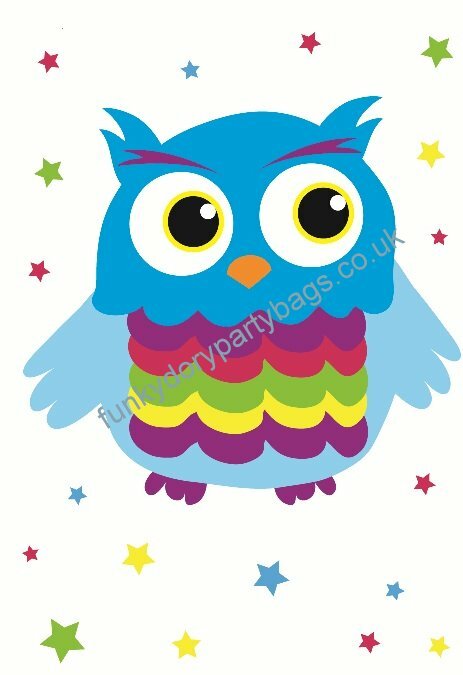 These include ideas for craft activities, animal themed party games, food ideas and of course, party bags! If you're planning a party in the near future, take a look, you might find some useful tips! We're always saying that we listen to our customers, and try to give them exactly what they want, and I like to think that in most cases, we do just that. 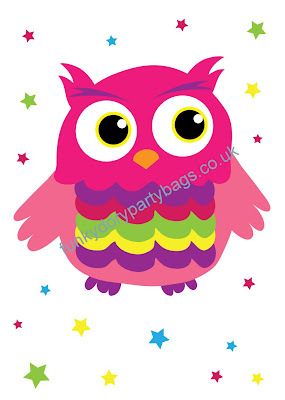 So when a customer contacted us recently suggesting that our Hooty Owl was perhaps a little too macho for a girl, we took note, and provided a very girly pink one! 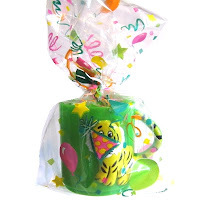 For a long time now, our business has been focussing on our speciality, printed cotton party bags. 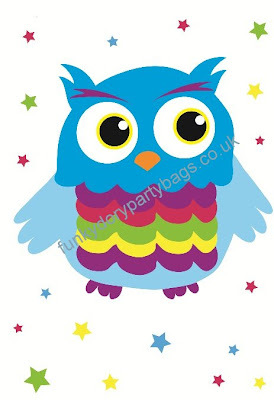 One of our most popular lines is our personalised printed cotton party bags. To accompany these, we also offer free printable colouring sheets, featuring the same characters that are printed on the bags. It seemed to us, the next logical step was to combine these two products to create a colour-in party bag! And here they are!! Launched this month, they are already proving popular because not only do they make a fantastic goody bag that will be of use long after your party or event, they provide a wonderful craft activity for children to do during long events such as weddings, Christenings and big family celebrations. Of course, we also supply special fabric crayons, which give a much better finish than a normal wax crayon, and each bag can be personalised with your child's name, giving them that extra "wow".